Leading Aboriginal artists and arts workers from across northern Australia will spend the next two weeks taking part in a ground-breaking Indigenous education program at The University of Melbourne. It is the first accredited University program in Australia designed specifically for Indigenous arts workers from remote communities and is a possible gateway to a Masters in Cultural Materials Conservation. 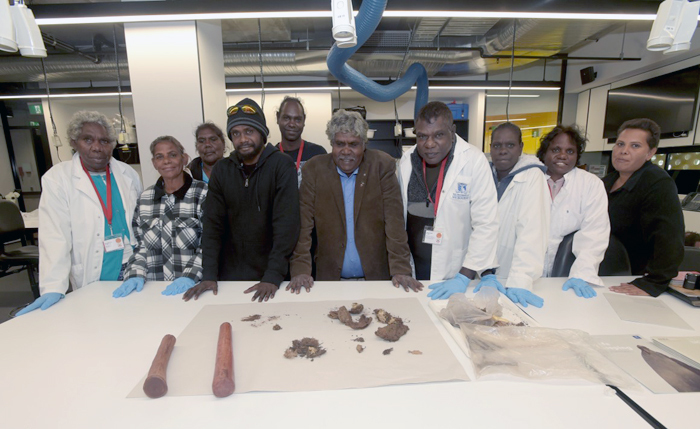 The Specialist Certificate in Cross Cultural Conservation and Heritage is the result of a unique partnership between the Arnhem, Northern and Kimberley Artists Aboriginal Corporation (ANKA), the Grimwade Centre for Cultural Materials Conservation and Trinity College at The University of Melbourne. It aims to enhance local Indigenous management of cultural collections in remote communities and further build Indigenous arts leadership across the Top End. Senior Yolgnu leader and ANKA Chairperson Djambawa Marawili contributed to the program on Monday 3 December. As ceremonial leader of the Madarrpa clan of North East Arnhem Land, Djambawa uses his art to communicate his wider socio-political aims, drawing on the strong foundations of Yolngu culture to educate, inspire and seek justice for his people. As part of the course, the nine artists and arts workers will investigate the development, management and care of important cultural collections held in remote communities with a team of senior artwork conservators led by Grimwade Centre Director Professor Robyn Sloggett. Participants are taking part in a cross-cultural symposium, learning about lab-based conservation and examining cultural collections to support their leadership at home. Professor Sloggett said the program was also an opportunity for two-way learning. "The artists and arts workers will also be doing some of the teaching, sharing their traditional knowledge about harvesting natural materials and using them for the production of artwork with staff and other students at the University of Melbourne," Professor Sloggett said. In 2017 ANKA and The University of Melbourne produced Safe Keeping: A Report on the Care andManagement of Art Centre based Community Collections (2.3Mb pdf), the first report on the important network of Art Centre-based community collections across northern Australia. The report identified the urgent need for local expertise and resources to care for remote community collections. The nine participants in the course are from Arnhem Land, the Tiwi Islands and the Darwin/Katherine region of the Northern Territory and the Kimberly region of Western Australia. The piloting of the Specialist Certificate in Cross Cultural Conservation and Heritage has been made possible with funding from the Northern Territory Department of Trade, Business and Innovation; INPEX Ichthys LNG Project; Australia Council for the Arts; the University of Melbourne, and Trinity College.